Week 7 saw me hit another 100km week and bring my monthly total over 300km. I also managed to get in three strength sessions, watch Ireland beat Italy 1-0 in the Euros 2016 at 5am, run 16km with Jeremy before breakfast on a Friday, saw 82kg on the scales for the first time in 4 months and run 21km at 5 min pace for the first time in months with Marie, Martin, Harrisson, and Niall. All in all an excellent week. Unfortunately, I am now rushing out to watch Ireland play France so I do not have time to wax lyrically about it. It is always good to start the week with a run and although I got home a little late, I pushed myself out the door and ran for 90 minutes. Harrisson has increased my strides from 5 to 8 and instead of timing them I have decided to count my steps. If I run at a cadence of 200, 50 steps should put me at about 15 seconds. I am really enjoying the strides and feel that they are making an improvement. I was feeling fairly tired tonight and decided to take a rest day. Wednesday morning I woke to see my RHR down to 41 and my HRV back over 80 so I knew that it would be a good day. As I headed down to the Tamagawa that evening I decided to do a MAF Test again. The results were about the same as the one that I did 2 weeks previous but because the weather was warmer and more humid, I felt satisfied. Thursday morning I got up at 5am to watch the second half of Ireland play Italy and enjoyed the goal 4 minutes from time. As I got up to watch the game I forgot to take my RHR and my HRV. I was tired for a lot of the day afterwards but went out and did my MAF run that night along with 9 strides as I seemingly miscounted. On Friday evening I had a real world appointment so I accepted Jeremy’s invitation to do a repeat of our early morning run. I left my house at 5:20 am and met him on Marukobashi at 6am. We did the same loop up to Futakobashi and it was a great way to start the day. On Saturday morning I had a real world activity and could not get out to go my run until after 4pm. It was muggy and warm and very hard to maintain MAF. Still I got around the course and managed my strides at the end. I answered a call on the Namban Rengo mailing list and went for a morning run with Marie, Martin, Harrisson and Niall along the Tamagawa. The planned pace was 5:00 ~ 5:10 and we fairly stayed to that all the way out. 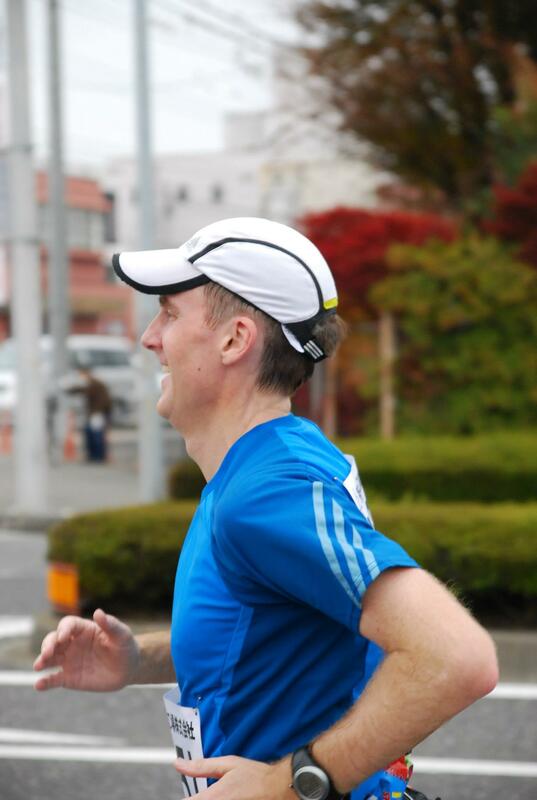 However, on the way back I started to feel good and pushed it a bit and ran the last 5km at 4:45. Hopefully that means I am starting to get some fitness back. After I got home I made myself a great smoothie with grapefruit, lemon, pineapple and turmeric. It seems that a lot of people are now interested in putting turmeric in stuff. Love that photo at the top. Thanks a lot Bob. Harrisson took it. I’m very happy to hear that you’re enjoying the strides !! Was good to see you today ! Let me know about the new strength exercise. Good week….well done. Impressed how early you start in the morning ! Thanks Jon, but I only got up that early twice!